Let’s look at exactly how that sales pipeline can be built and how CRM software can help you accomplish this task. It is also vital to ensure that enough information has been obtained about a customer so that a realistic estimate can be made as to exactly how much money they might spend. Again, CRM can aid the company in this endeavour by helping to collect as much relevant information as possible. Once a customer's spending has been estimated, the sale can be planned. In some cases, the person responsible for making the final decision might actually be the lead himself. However, for many customers, especially those in B2B, the decision maker will actually be a key executive who has to judge solely on statistics, which is something that CRM can help to provide. Creating activity to have teams follow up is key and this should where possible be an automated process, if individuals are interacting with the organisations web site and requesting information via email or by phone then a process should be in place to capture the content of the activity though workflow or integration. By having seamless activity creation the process by team members for follow-up is made far easier and guaranteed to be done, as the activities are already in the queue. As long as the follow up process is slick and well defined and that the data is being recorded then the measurements of results will come naturally as the data being recorded will be part of the CRM and in the database. 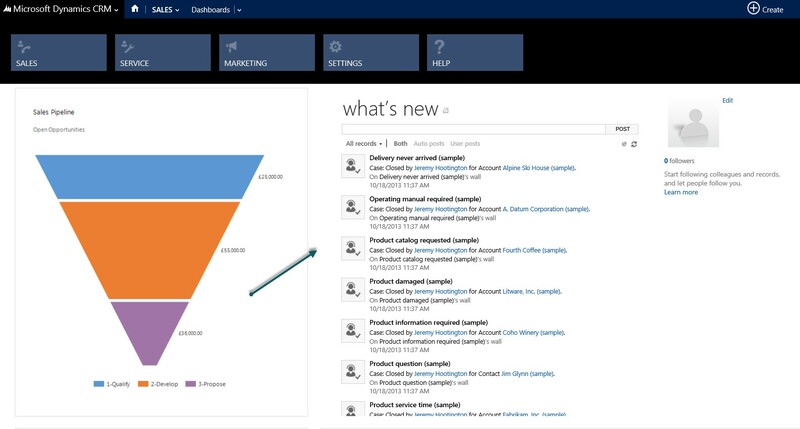 Solutions like Microsoft Dynamics CRM have some great chart and reporting capabilities built in and these tools can help present collated data as a snap shot view of what is happening in your business.